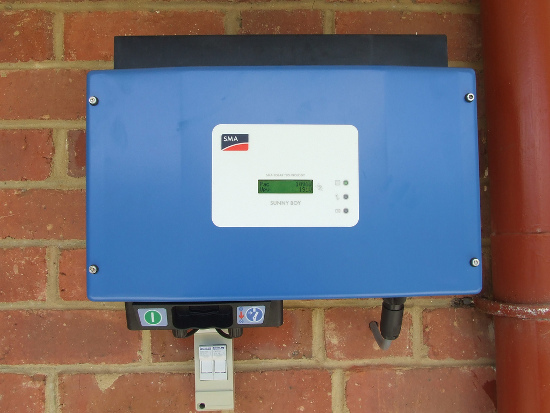 Solar Inverters – What are They and How do they work? Solar inverters are a critical part of the solar system for your house: they take the electricity created by your solar panels and transform it into power that the appliances in your home can use. Solar panels create DC (direct current) electricity. Even though many products, like your laptop or TV, actually run on DC power, the electricity networks in the U.S. (and therefore the plugs in your house) use AC (alternating current) electricity. AC power can easily switch to high voltage levels, meaning it can also easily travel over long distances. In some other countries, the grid runs on DC electricity and inverters wouldn’t be necessary. What type of solar inverter can you get? Central inverters are the most common- these are boxes that are often installed in garages. Typically, one inverter will be paired with a certain number of solar panels. This is difficult to do properly and is usually the hardest part of designing a solar array. The other major issue with centralized inverters is that it’s difficult to add panels to the system later. The other option are microinverters, which are miniature inverters attached to each solar panel. In this setup, DC power created by the solar panel is directly converted into AC before it moves to the house. The major advantage here is the panels become modular units and it’s easy to install them and add panels later. Microinverters have become more popular over the last few years, but each type of inverter has different advantages. Both central and micro inverters can be up to 95% efficient. Central inverters have been in use longer, and are less expensive than micro inverters. They may be easier to repair, if anything needs to be fixed, because all of the parts are in one place. The downsides? If one of the panels on your roof is shaded, if you’re using a central inverter, the output from your whole array can drop significantly. The output will only be as strong as the weakest panel. If you decide to add more solar panels to your array with a central inverter, you may end up needing to get a second inverter, because they each can handle a limited amount of capacity. Another weakness of a central inverter is that you won’t be able to monitor how each individual panel is performing. Microinverters take care of the problem of shade; because they’re attached to each panel, if one panel isn’t as efficient as the others, it won’t drag the performance of the whole system down. If your roof is partially shaded at some point during the day, that might be a good reason to consider microinverters. They’re also safer than central inverters, since they’re not concentrating large amounts of voltage in one place. Microinverters make it easy to monitor how each panel is performing. If something happens to be wrong with one, you can quickly discover that. They’re more expensive, but the newest models may be able to harvest more energy (perhaps even 20% more) than central inverters. Inverters are usually about 95% efficient. When your electronics convert AC power back to DC (that’s the magic going on in the black box attached to your laptop cord), that’s a little less efficient, and you might lose 10-40% of the power. That’s the case whether you’re using solar power or regular power from the grid– it’s just a not-so-smart part of how electricity works in the US.